12th February, London – Champagne Louis Roederer Brut Rosé 2009 and Cristal 2006 were poured to guests of the Decanter Royal Opera House Gala dinner on the 9th of February 2016. 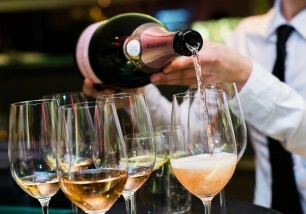 This dazzling event was jointly organised and hosted by Decanter and the Royal Opera House London. The Gala Dinner raised more than £250,000 for the Royal Opera House Covent Garden Foundation, which strives to encourage young people to participate in the creative arts, offers apprenticeships and commissions new work. Guests at this sell-out event were entertained by the Royal Opera House’s musical director, Sir Antonio Pappano, who performed alongside fellow opera stars, Bryan Terfel, Ermonela Jaho, David Junghoon Kim and Vlada Borovko. An auction, led by Christie’s David Elswood and Anthony Hanson MW, offered guests ten unique wine and opera lots. All proceeds will go to the Royal Opera House Covent Garden Foundation. Frédéric Rouzaud, the Managing Director of Champagne Louis Roederer, attended the event alongside other famous names from the wine industry, including Hugh Johnson and Baron Eric de Rothschild. Guests were welcomed on arrival with a glass of Champagne Louis Roederer’s Brut Rosé 2009 and later enjoyed a taste of Champagne Louis Roederer’s flagship wine, Cristal 2006. Champagne Louis Roederer is very proud to support the Royal Opera House Covent Garden Foundation, and shares their commitment to helping young people engage in the arts. For further information about the event please contact Marinel FitzSimons.